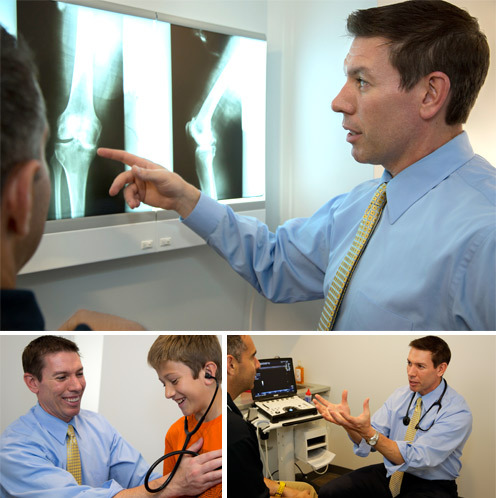 Dr. Skvarla is a Board Certified family physician who has been active in primary care for the last 7 years in the Fox Chapel suburb of Pittsburgh, Pennsylvania with a focus on both Family Care and Sports Medicine. Dr. Skvarla is a trained osteopathic physician who specializes in Family and Sports Medicine and is a member of the American Medical Society of Sports Medicine and the Pennsylvania Medical Society. After graduating with his medical degree (D.O.) from Lake Erie College of Osteopathic Medicine, he completed his post graduate training with an Osteopathic Medical Internship at Ohio Valley Medical Center in Wheeling, WV and a General Surgical Internship with UPMC in Pittsburgh. He then went on to complete his residency in family practice at West Penn Hospital in Pittsburgh. In addition, he completed a Sports Medicine Fellowship at St. Vincent Health System. Dr. Skvarla specializes in preventive care and care of the entire family, from newborns to grandparents and believes that health care providers should be guides for patients to navigate lifestyle choices and form good habits. Dr. Skvarla has two children with his wife Kristine and can often be found coaching his son in various sports in Fox Chapel. Kristine Watson is a Board Certified Family Nurse Practitioner and has over twenty years of experience as a nurse including the past sixteen specializing in Family and Internal Medicine. Watson earned a Bachelor’s Degree from West Liberty State College and then completed her Master’s degree in Nursing from Wheeling Jesuit University. After obtaining her degree, she joined a practice within the Ohio Valley Medical Center in Wheeling, WV for 5 years. In 2007, she began work with North Hills Internal Medicine, part of what is now the Allegheny Health Network, in the northern suburb of Pittsburgh, PA. Watson then joined Dr. Skvarla with whom she has been practicing with since 2013. Watson is an active member of the American Association of Nurse Practitioners. She is also a founding member of the Advanced Practice Nurse Practitioners of the Upper Ohio Valley, established with the purpose of providing formal continuing education in the nursing field. Watson has a reputation for serving as an advocate for her patients with a strong focus on the maintenance of their health and wellness. When Watson is not taking care of her patients, she can be found spending as much time in the great outdoors with Dr. Skvarla and their two children.